From the safe harbour at New Quay to the exciting launch across Cardigan Bar at Poppit Sands, Cardigan Bay has sailing and boating to suit all levels. 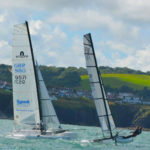 Tresaith Mariners are hosting the United Kingdom F18 Catamaran Nationals on the August Bank Holiday weekend (24th – 26th August 2019). More details to be posted very soon, including the Notice of Race – but you may wish to book accommodation in Tresaith or locally now . There will be the very popular beach bar in the marquee on the beach, along with live music till late and great food. There will also be a race training weekend the week before, and you are welcome to leave boats here in-between. Food will be available at the club throughout the weekend from Friday night. Food and entertainment Saturday and Sunday evenings will be included in the cost of entry for all sailors (live band Saturday night). Commemorative T-Shirts will be available to pre-order and collect on the weekend. Charter Boats Tresaith Mariners have a couple of F18s that may be chartered for the event (and pre event training weekend) – please contact them for details via their website. They can also help put you in contact with potential helms or crews should you be short handed! Moorings are available at Patch on the Teifi Estuary and the harbour at New Quay pictured above has a sailing club. Please download a copy of the Ceredigion Marine Code [PDF] which details how to protect Cardigan Bay dolphins, seals and porpoises. Cardigan Bay Watersports offer taster sesssions for sailing, kayak, windsurf, paddleboard, waterski or wakeboard. They teach RYA sailing courses, windsurfing courses or RYA powerboat courses in New Quay.